Yeti’s are great coolers but they are EXPENSIVE! 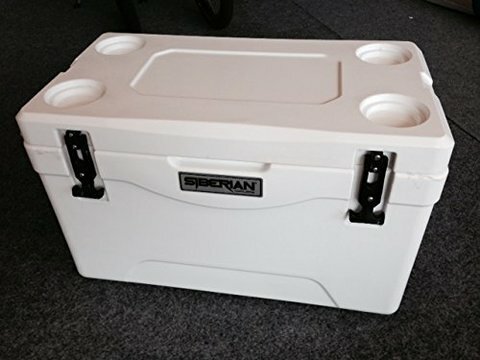 The Pelican ProGear Elite is my recommendation for the best yeti knockoff cooler for a number of reasons. Why Do People Love Yeti Coolers? Yeti were the first brand to bring out a high-end roto-moulded cooler. Before Yeti came to the market the only coolers you could buy were the cheap plastic ones that kept ice for about 1-2 days. The Yeti came out promising to hold ice for up to 7 days and blew every other cooler out of the water. A roto-moulded case with around 2 inches of insulation plus cool rope handles and it was bear proof! The Yeti cooler was (and still is) built to be a tough, durable and amazing cooler. Since Yeti created the category in 2006 there have been a lot of other companies entering the high-end cooler market with Yeti-like coolers of their own. The majority of these companies boast one or more features that are better than what is on offer on the Yeti and almost all of these coolers are cheaper than the Yeti. Yeti continues to dominate the market with it’s well known brand name and superior distribution but many other models actually perform better than the Yeti. While these coolers are not technically “knock-offs” (they don’t copy Yeti’s branding or pretend to be Yeti in any way) they have copied the major features that made Yeti coolers so popular. You should buy a yeti knockoff cooler because you will save money, which will allow you to buy 2 coolers or to buy a larger size cooler for the same price. 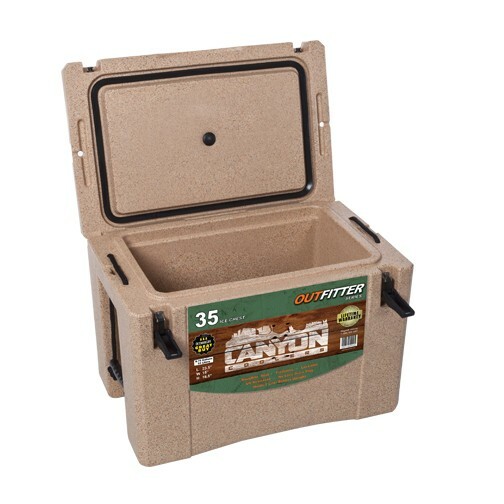 If you do your research and buy the right cooler you will get longer ice retention than the Yeti and get improved features like better handles, measurements on the lid and built in bottle openers. Plus Yeti only offers a 5-year warranty where many of the knockoff brands offer lifetime guarantees. The Pelican ProGear Elite is not a cheaper version of the Yeti, it’s an improved version of the Yeti that is better in a number of ways. Here are 7 reasons I like to recommend the Pelican over the Yeti. The reason you are even considering spending hundreds of dollars on a cooler instead of buying the $30 one from Walmart is because of the superior ice retention. 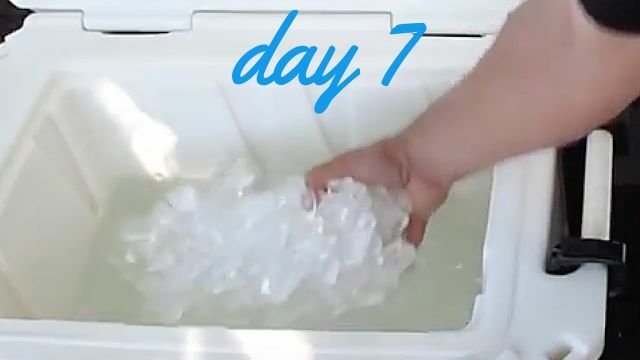 Yeti has great ice retention with approximately 5-7 days but Pelican has even better ice retention with 7-10 days. Many ice tests have been done on these two coolers and the Pelican always seems to outperform the Yeti in a variety of circumstances. It is just a better cooler at retaining ice. 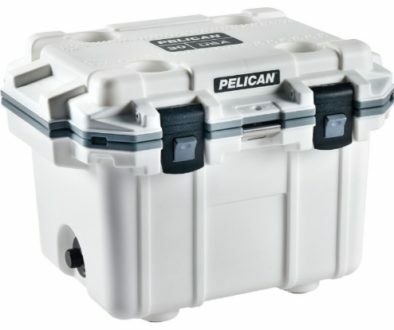 The price of the Pelican cooler is significantly less than the Yeti. We are talking hundreds of dollars less. Look at the comparison chart below of the smaller sizes to see the price differences. Please note: Prices below were taken from Amazon on a single date. As Amazon adjusts prices all the time these may not perfectly reflect current prices. As you can see from the comparison chart in all cases Pelican coolers were at least $100 cheaper than Yeti coolers and for the 45-Quart it was over $200 in savings. This chart doesn’t even reflect that a Yeti 45 actually only has a 37-quart capacity. So with the Pelican you are getting more internal space at a better price. 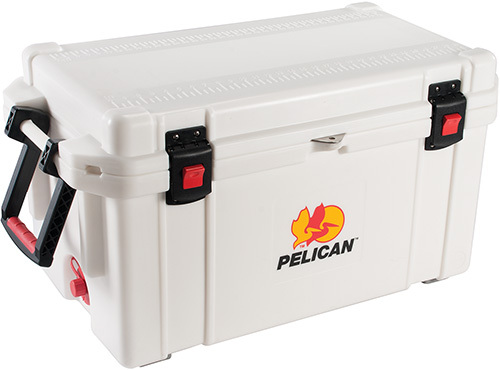 There are 4 other brands of coolers that compare to the Pelican in terms of ice retention. Canyon, Siberian, Engel and Orca. While (in my honest opinion) the Pelican has the most features out of any model it’s also important to compare it to the other Yeti knockoffs on the market. Below is a comparison chart showing the differing prices of competitor coolers for the most popular sizes. Again please note this may not completely reflect today’s price. So take this with a grain of salt. 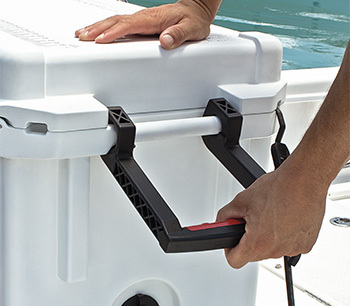 Yeti coolers have nylon rope handles with a rubber handle. Pelican coolers have both a moulded in handle for single person carrying and two fold up handles for easy carrying when you have a friend to help you. These handles are much easier to use than the Yeti handles. The press and pull latches on the Pelican are great. When you close the lid they just click into place. 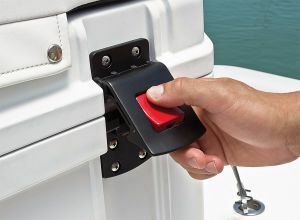 To undo them simply push the button and lift up the latch. These are super easy to undo even when you are wearing gloves and they give a great solid seal for the lid. 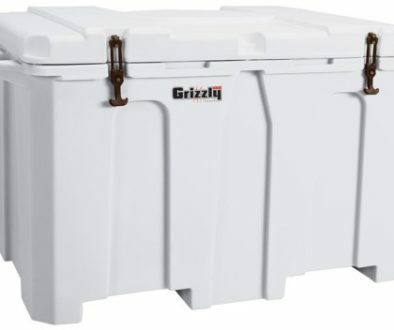 The Yeti is a bear-proof cooler but only when it has padlocks locking the lid on. Because of the durable design of the Pelican’s latches, it is actually bear resistant even without padlocks. So if you forget to lock your cooler up at night, you can stress a little less when you hear noises outside your tent. The Pelican’s drain outlet has 2 benefits over the Yeti. This sounds like it isn’t a big deal, but when you are camping it can stop your tent getting wet without the back breaking work of carrying a cooler full of water away from your campsite. Plus it’s also great for fishing and will help you avoid getting the smelly water on your shoes and clothes…or inside your boat. Sloped Drain – The Yeti has a very small catchment area for the drainage plug. The entire base of the Pelican acts as a catchment area and is sloped so you can fully drain your cooler without needing to lift it at all. A small feature but important for some people (especially fishermen) is the added measurements on the lid of the Pelican. The Pelican comes in 9 colors – Outdoor Tan, Dark Blue, Gray, Light Blue, Marine White, Maroon, OD Green, Orange and Purple. 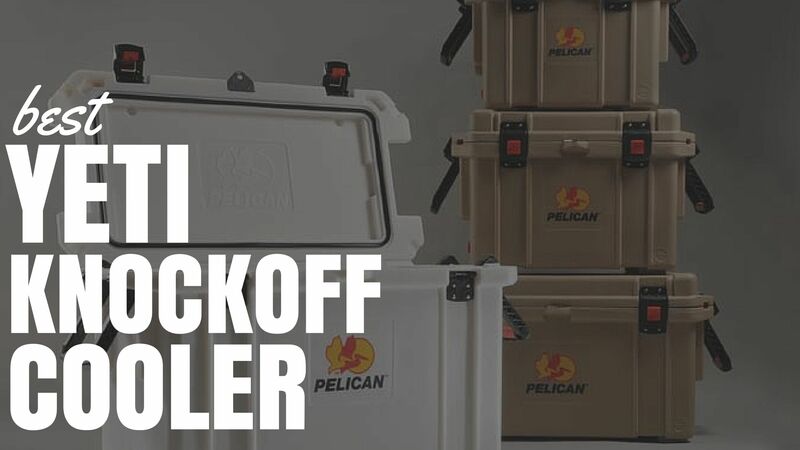 The Pelican’s colors are much more exciting than the Yeti’s colors and while most people will go with the popular white or tan options the Pelican gives you the ability to make a bold statement with your cooler. My favorite color is the dark blue or maybe the white. 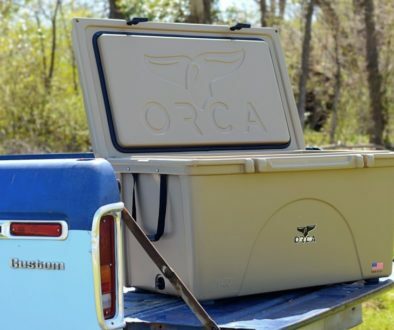 Heavy – The Pelican cooler is significantly heavier than the Yeti with the 45-quart sized cooler weighing roughly 10lbs more than it’s Yeti counterpart. Condensation on drain outlet – One complaint by a lot of people is the fact that the drain outlet attracts a decent amount of condensation with can wet the surrounding floor. Padlock sticking out at the front – The metal latch for the padlock sticks out at the front of the cooler in a triangle shape. This means if you are carrying it by yourself it’ll stab you in the stomach. The easy solution is to carry it with the back of the cooler against your body. This wouldn’t be a balanced article without talking about the reasons you should buy a legitimate Yeti cooler instead of a knockoff. Yeti coolers are well known throughout America and the world and are very desirable. Your Yeti cooler is sure to be the envy of your friends with $30 coolers from the local store. You might not get the same effect with lesser known brands like the Pelican, Canyon or Siberian. However, buying a Yeti when your friend has a Pelican is going to make you feel like you paid more for a cooler that isn’t as good. This article almost featured the Canyon cooler as the best Yeti knockoff cooler. 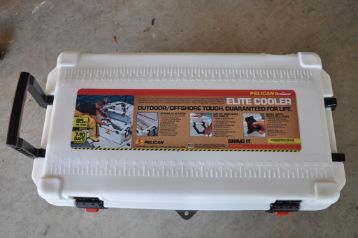 It has arguably the best ice retention of all coolers with thicker insulation than any other brand. I love this cooler and would happily recommend it to anyone considering it. For a full write up see my Canyon Cooler vs Yeti showdown. Siberian coolers are the most beautiful roto-moulded coolers on the market. With similar (if not better) ice retention than the Yeti these are a great buy for anyone looking for the cheapest option. They do lack some features (like being bear proof) and haven’t made significant improvements to the Yeti design like the Pelican has with its handles and the Canyon has with its extra insulation, but it is still an amazing cooler and I would happily recommend it to anyone who wants a great looking cooler.